Yarn Type SALE 20% OFF! A unique modern construction of four shades, creating an interesting yet delicate colour palette. Interchangeable with Truesilk and Cotton Glace this yarn has lots of pattern support available. 100% cotton. Machine washable at 30 C.
A collection of twelve designs by Lisa Richardson for men and women, using Rowans Tetra Cotton. The designs are relaxed and easy to wear with open work stitch details making these garments the perfect summer cover up. The collection ranges from textured sweaters to lace openwork cardigans and shrugs. Photographed with the beach as a backdrop to highlight these summers knits. We regret that this book is now out of print and have no more stocks. 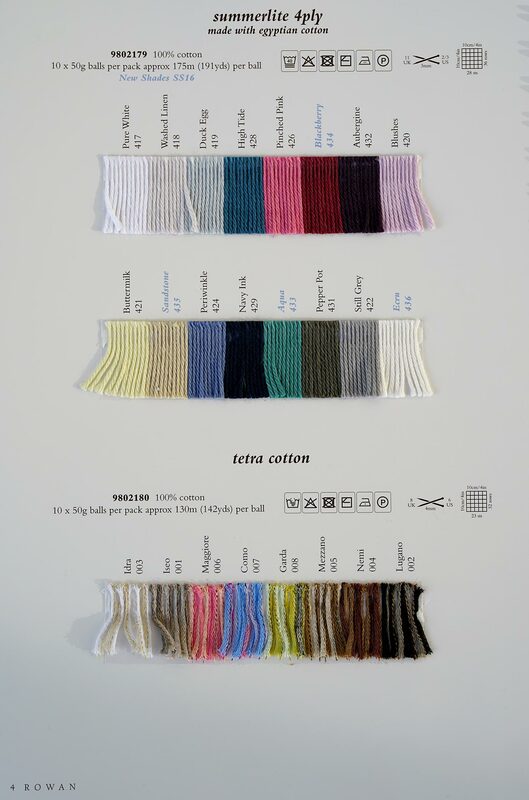 We will be happy to send a copy of any design (free of charge) with anyTetra Cotton yarn purchase.